Get exclusive VIP access to our food celebration one hour before gates open to the public, two drink tickets, ten tasting tickets, and access to the VIP-only area. Because there are plenty of ways to consume a calorie. Do it right. Please note: All sales are final; no refunds or exchanges. Last call for alcohol is 75 minutes prior to event closure. Tasting tickets & beverage tickets are not redeemable for cash & are only valid on May 11, 2019 at The Queen Mary's Waterfront Cook-off. If you're craving a good 'ole fashion showdown, come watch food experts compete to win top chef prizes. Get five tasting tickets to enjoy our plethora of food options, enjoy DJs spinning, family-friendly games, eating contests, and more in our outdoor events park. Please note: All sales are final; no refunds or exchanges. Last call for alcohol is 75 minutes prior to event closure. 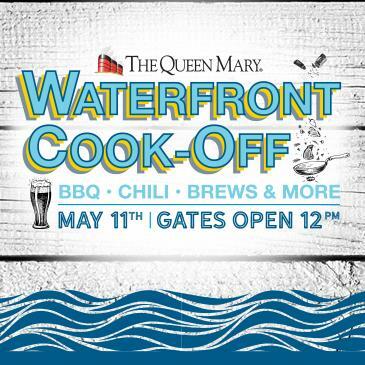 Tasting tickets are not redeemable for cash & are only valid on May 11, 2019 at The Queen Mary's Waterfront Cook-off. The Queen Mary’s Waterfront Cook-Off will be a treat to your taste buds with a plethora of food options, DJs spinning, family-friendly games, eating contests, and more in our outdoor events park. *Located off site. Please visit aquariumofpacific.org for directions &hours of operation. Please note: Due o the historic nature of The Queen Mary, some areas of the ship may not be accessible to guests with mobility restrictions. Tours may require extensive use of stairs &/or standing for long periods of time. Tour locations may vary daily based on availability. Please note: Due to the historic nature of The Queen Mary,some areas of the ship may not be accessible to guests with mobility restrictions. Tours may require extensive use of stairs &/or standing for long periods of time. Tour locations may vary daily based on availability.